Here, we are implementing a python program to create a stack plot using matplotlib.pyplot. Problem statement: Create stack plot in python (using matplotlib.pyplot). Stackplot function is used to draw stackplot in python. The xlable, ylabel title gives the labels and title to the plot. 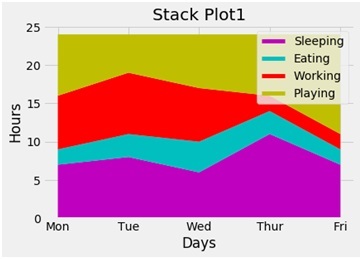 Different colors can be given to the different levels of the stack plot.